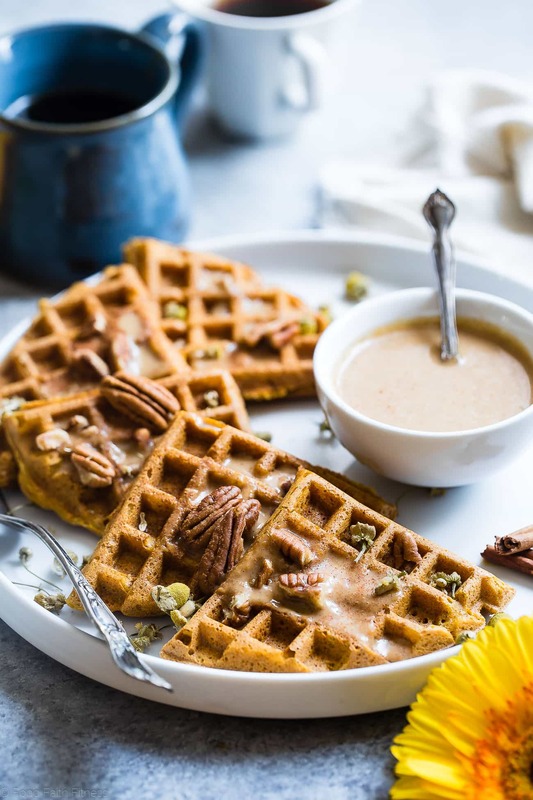 These pumpkin paleo waffles are covered in a pumpkin spice cream sauce! You’ll never know they’re vegan friendly and gluten, grain, dairy and sugar free! Crispy level? SO HIGH RIGHT NOW GUYS. These waffles. Man oh man oh man oh man. I can hardly contain my excitement for the moment in your very real person life when your teeth sink into a golden brown CRUNCH and then end in pillowy-soft-light-as-air-waffle NIRVANA. WITH PUMPKIN SPICE! Aaaaaaand pumpkin spice CREAM SAUCE. Liiike, PUMPKIN SPICE TIMES 2. Spoiler alert: pumpkin spice cream sauce is EVERYTHING on this planet we call Earth. You’re going to want it on everything. In everything. Totally having a moment with ridiculously creamy, spicy-sweet creamy goodness. Every happy-morning breakfast of my childhood revolves around a steaming stack of “Daddy Waffles.” My Dad makes these RIDIC amazing waffles with the CREAMIEST of white sauces, that you slather ALL over waffle perfection and top it ALL off with sweet bursts of fruity strawberries. This Mennonite recipe (my fam is a bunch of VRY modern Mennonites) has been in his fam for generations and they all make this recipe. Everyone who eats it obsesses over it forever and ever the end. Mr. FFF even ate 8 at once. LIIIKE, 8 FULL waffles —> IE 8, 4-square waffles. Not 8 little SINGLES. I wasn’t sure if I should be mad or impressed, you know? Anyway. Dad’s version is loaded with sugar, SO much oil, processed flour and ALL THE DAIRY. So, limiting them SPECIAL OCCASIONS if SUPER essential. And Mr. FFF? Can’t even EAT THEM ANYMORE due to the “lactose intolerance” situation of his body. That’s just an extremely long, story-filled way of telling you about the birth of THESE waffles. Like to pretend I am trendy. Like pumpkin spice just as much as you. Do you ever take something really good and mess with it? I told you about how I do this VRY VRY regularly in last week’s chai gluten free pumpkin cheesecake, and this recipe is no different. 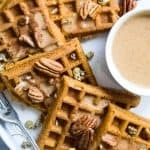 I was going to use the basic waffle recipe for the single serving vegan protein waffles because I know it WORKED. But, then something in me wondered what would happen if I CHANGED UP the flour ratios. You guys. THOSE waffles were SO crispy. But these waffles? Like I said: CRISPY LEVEL SO HIGH RIGHT NOW. Off the charts. Ranking 14 on a scale of 1 to CRISPY CENTRAL YO. Before you ask, yes, you do need to use your microwave. I have no other way of knowing cooking times and have not tested any other way. If you read the instructions (and by “if” I mean DO IT. THOROUGHLY) it may seem a little daunting to get it all perfect and boil-y and thick. Once you master the cooking time, this sauce is SNAP-SNAP-SNAP to make. An easy peasy, whisk-it-together-and-call-it-DELICIOUS-in-your-mouth-kind of thing. See also: both the sauce and waffles freeze well which = waffles for breakfast before work can be coming to a WORK morning NEAR YOU. Girlfriend, put down that usual glowey-green smoothie and switch it up. 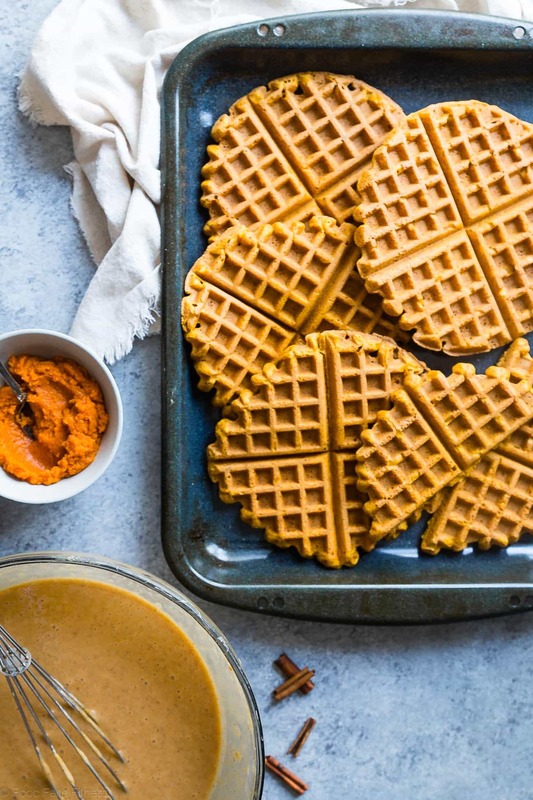 A little pumpkin-spice-pep-in-your-step is just what your cozy-fall-food-loving-self needs. 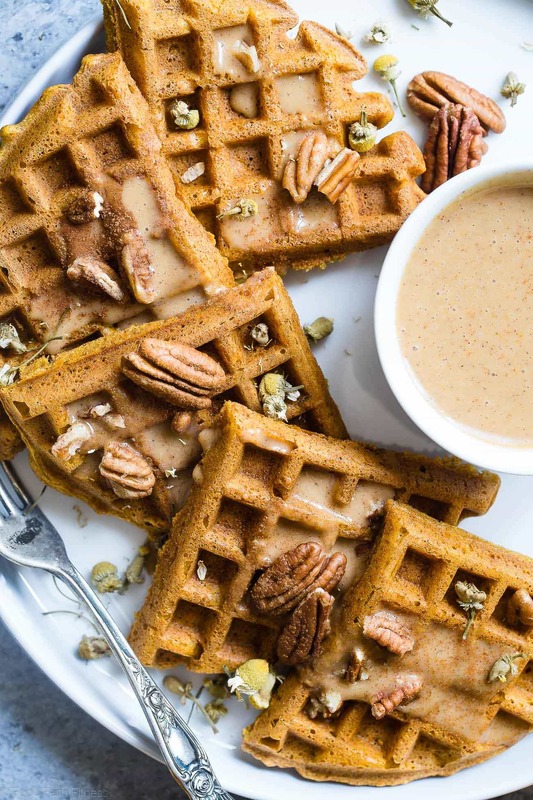 These pumpkin paleo waffles are covered in a pumpkin spice cream sauce! You'll never know they're vegan friendly and gluten, grain, dairy and sugar free! Please read the WHOLE recipe before beginning, as it will really help you nail down results! Place the 2 Tbsp of apple cider vinegar into a large measuring cup and fill with the coconut milk until it reaches 2 cups. Whisk and set aside for 10 minute. Once it's sat, add the mixture into a blender. Add in the almond meal, 1 1/2 cups Tapioca starch, 1 cup of pumpkin, the coconut oil, baking powder, 2 Tbsp of the pumpkin pie spice, and the cinnamon. 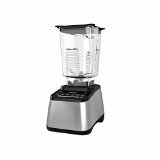 Blend until smooth and creamy, stopping to scrape the sides down as necessary. Remove 1/2 cup of the batter and set it aside. Let the remaining batter rest while you begin the sauce. Dump the rest of the coconut milk into a large measuring cup (you should have about 1.5 cups) then add in the almond milk (to read 3 1/2 cups of liquid.) Stir together, then remove 1/2 cup of the liquid and set it aside. 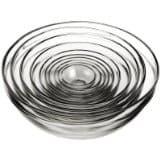 Pour the remaining 3 cups of milk into a LARGE, microwave-safe, clear glass bowl. It's key to use clear, as you need to be able to see the mixture. It also rises A LOT, so a large bowl is also very important! Microwave the liquid until it just begins to boil, about 7-8 minutes depending on the strength of your microwave. While the liquid boils, whisk together the batter and milk that you have set aside. Then, add in the monk fruit, nutmeg and remaining 1/2 cup of pumpkin and 2 tsp of the pumpkin pie spice. Finally, whisk in 2 Tbsp of the tapioca starch, one at a time, so that it doesn't get clumpy. 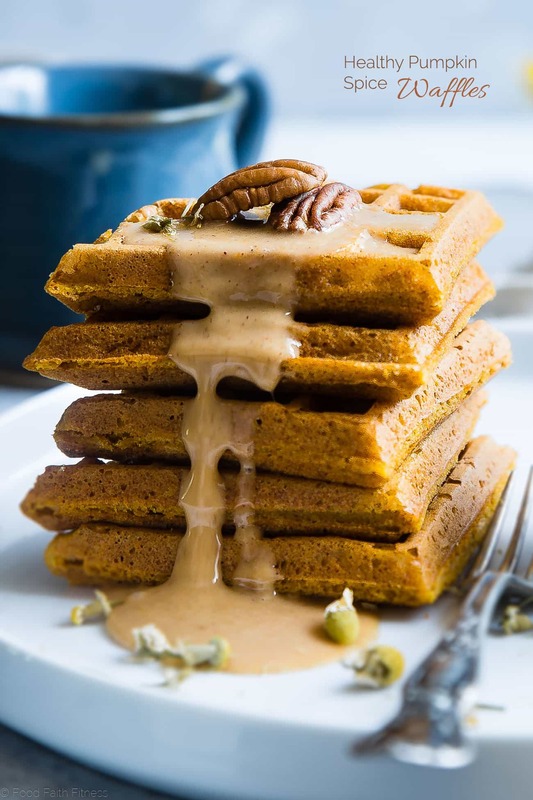 Once the milk has started to boil, remove it from the microwave and immediately pour in the pumpkin/batter mixture, whisking until well combined. This is where it gets a bit tricky**. You need to microwave it until it begins to boil, then microwave it for 1 more minute once boiling. My batter boiled at 5 minutes, so I cooked it 6 minutes. Then, stop and stir. Repeat this process 3 more times, watching the sauce to see when it boils and then cooking 1 more minute. My sauce took 1.5 minutes to boil each round, so I cooked it for 2.5 minutes. It looked like this: cook 6 mins. Stir. Cook 2.5 minutes, stir. Cook 2.5 minutes, stir. Cook 2.5 minutes, stir. 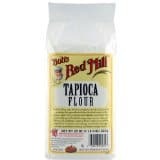 Place the remaining 1 Tbsp of tapioca starch into a medium bowl and add in 3 Tbsp of the hot liquid. Whisk until smooth. While whisking, stir this into the sauce until well combined. Repeat that same cooking process one more time - this was another 2.5 minutes for me. Remove the sauce from the microwave and let it stand for 10 minutes to thicken, stirring every so often so that it doesn't develop a skin over top. I usually begin cooking the waffles when the sauce is microwaving, and then keep them in the oven to stay warm. Spray your waffle iron with coconut oil spray and heat it on the highest setting (note that I have a classic waffle maker, not Belgium!) Ladle in 1/3 cup of the batter, spreading it out just slightly. 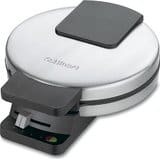 Cook until your waffle maker stops steaming. Then, cook and additional 1-3 rounds, depending on how crispy you like your waffles. We like ours really crispy so we have each waffle a total of 4 rounds. Serve waffles with the sauce, one it's thickened up, and DEVOUR! **It may take some time for you to master the cooking time here. But, once you get it, it's totally worth it! They look great! All about pumpkin spice! I love crispy waffles and haven’t had one in forever! I have to try these, and the sauce too. Yummmmm! You DEFINITELY need to get on these then!! WOW is right! I always have such fond waffle memories, because they usually were only made around the holidays in my house. My dad would make amazing waffles too (but with ALL the stuff…). 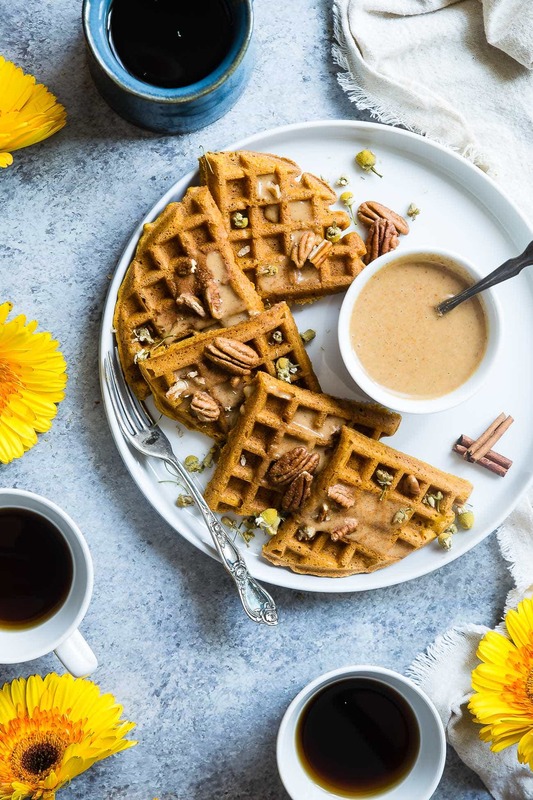 These sound like such a good way to make waffles healthier and happen a little more often! It’s funny how dads always seem to do breakfast RIGHT! Thanks friend! DROOL. These look SO good– and I can hardly believe they’re healthy! Definitely needs to happen this weekend! They sure do! Thanks Karly! it’s definitely that time of year again! PSL everything. these look delish! What a beautiful way to do breakfast. Those waffles! That pumpkin spice cream sauce! So glad you think so! Thank you! I haven’t had waffles in ages! I really miss them <3 <3 <3 these ones look wonderful! I bet they made a fantastic breakfast! I think so! Thanks girlfriend! Help! I don’t have any monk fruit! What can I use instead? PS: I have regular sugar, coconut sugar, maple syrup and honey available. Hi Karen! I would try regular sugar – however the sweetness is a little bit different! 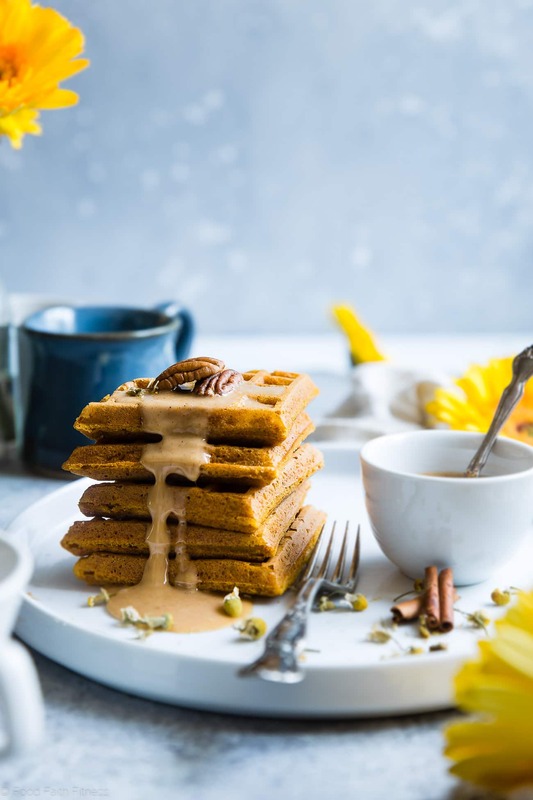 You may want to try a little less sugar first, keeping in mind you MAY need to add some at the end (or drizzle with maple syrup.) I really just can’t tell you exactly as recipes are only tested as written! Let us know what you try! Yum, want to eat it now! That pumpkin spice cream sauce!